By Libby Kinsey, Sebastian Spiegler & Laure Andrieux. We @ProjectJunoAI are big fans of landscapes. 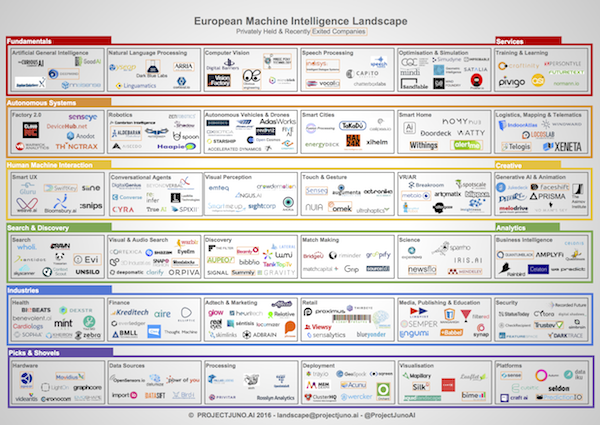 That’s why we’ve created a machine intelligence landscape focused entirely on Europe . Europe deserves a landscape of its own to highlight its talent and expertise. Until recently, its contribution to the innovation and commercialisation of machine intelligence technologies has been under-appreciated. We now see growing self-confidence borne of the success, and continued presence, of local acquired startups like VocalIQ, Swiftkey, Deepmind, Magic Pony Technology, and PredictionIO. London is Europe’s startup centre, mixing capital, proximity to markets, and world-class research hubs. Not to mention that we are proudly European — British, French, and German — with our associated partialities. We have focused on startups. This is where our hearts lie. We plan to look at corporates, research institutions, and VCs at a later date. These are the companies whose business is machine intelligence itself. Whether building engines specifically for vision, language, speech or general optimisation problems, or working on algorithms and techniques intended to have very broad applicability (Artificial General Intelligence), these companies invest in proprietary methods and expertise. Google Deepmind is the most prominent example in this category, having applied its methods to such seemingly disparate tasks as mastering the millennia-old Chinese game Go, cutting data centre energy use, and synthesising natural human speech. These companies have sprung up to address a skills gap, providing the training and education necessary to meet the demand for specialist roles in machine intelligence. With one robotics expert and one unreformed(-ish) hardware investor on our team, of course we’re interested in physical systems using machine intelligence. These might be sensor networks capable of dynamically optimising resources in the home or city, intelligent manufacturing systems, robots in the factory, home or service sector, and let us not forget autonomous vehicles. The latter category is remarkably populous in Europe — MobilEye, Dibotics, Oxbotica, AdasWorks, Dyson, FiveAI, Innoviz Technologies, and Starship Technologies — and may reflect academic and industrial expertise here. Machine intelligence offers a real chance for natural interaction with the machines and computers that facilitate our everyday lives. Machines of the future will be able to “perceive” us in multiple ways, and they may also have personalities and emotions of their own. Such interaction necessitates natural language understanding that is context specific, in speech or text form, another topic close to our hearts due to our team’s background, and one that is still far from ‘solved’. The popularity of chatbots is one nod in this direction. This category also covers the myriad ways in which companies are using smart learning techniques to build intuitive user-experiences (from Swiftkey’s predictive keyboard to Weave’s explainable contextual assistance), and providing machines with the ability to respond to visual or physical cues. Deep generative models are already emulating human creativity in some fairly narrow domains. They are being used by Jukedeck and Melodrive to compose music, and by DeepArt and Prisma to create art. These creations have triggered conversations about the human creative process. When will we see compositionally coherent longer-form pieces generated by computers? In an era of human redundancy, of what value is creativity? This is one area where the tension between human and machine will be most keenly felt. Machine intelligence is also being harnessed to enhance or edit media, create virtual worlds, and imbue video game characters with evolving goals and personalities. Information overload is a thoroughly modern malaise, making finding the information you’re looking for or the best match for your query more and more difficult. At the same time, the amazingly ‘prescient’ personalisation and recommendation algorithms we encounter every time we surf the web or use an app have raised our expectations. By a narrow definition of user engagement — be it pages viewed or items purchased — these algorithms are very successful, but in a broader sense, where user experience, learning, anddiversity of opinion are also important goals, there is still work to be done. The next generation of search and discovery startups are looking at interfaces that allow users to control recommender goals or to process natural language or visual queries. They can parse attributes as well as labels and respond to interests that evolve over time. The ‘match-makers’ attempt to match job seekers with jobs, startups with VCs, and daters with one another. These companies apply machine intelligence to businesses (and public/third sector entities) in order to enable them to surface and visualise data, deliver actionable insights, and make informed decisions. They can help to uncover new strategic opportunities, evaluate what works, and optimise resource allocation. This is a catch-all category that would be 10 times bigger if space allowed, and reflects — in part — the rapid maturation of machine intelligence technologies which has enabled companies to solve problems for a particular vertical or function in which they have expertise and/or a data advantage. This is the only category that we’ve filtered by startup volume — you can pretty much pick any industry and find a startup addressing its specific requirements. It’s tempting to say that volume relates to the markets — finance, health, media, adtech, security — where we could claim that starting up in Europe has certain advantages, but we need to further test this hypothesis. For instance, within health, we can subdivide startups into administration and workflow, analytics, diagnostics and therapy, monitoring and telemedicine, and patient, consumer and wellness types. Meanwhile, finance is a mega-category including consumer apps, credit scoring and lending, fraud detection, robo-trading, and compliance. That’s our code name for enabling technologies. Machine intelligence wouldn’t exist without them, and we think they’re a fruitful investment class. Hardware has been out of fashion with VCs, yet machine intelligence offers the type of truly massive opportunity that chip-economics requires, and Europe has form in silicon design (ARM/Apical, Movidius etc) — not that we’re biased. While the EU’s data privacy and security regulations might at times frustrate attempts to collect and use data for learning, they also present an opportunity to find win-wins that protect individuals and maintain data utility. Powr of You and Privitar are two interesting companies in this category. Machine learning platforms package cutting edge research and infrastructure into scalable, robust, user-friendly tools. Startups like Seldon and Craft.ai take the pain out of implementation and allow data scientists to focus on their particular problem and data. We love them for that. We had to leave out lots of companies to make the landscape legible, and no doubt we’ve made some “misclassification errors” and have “false negatives”. This is a first pass, which we hope will spark conversation, uncover exciting new areas, and shine a spotlight on European talent. Libby Kinsey works with machine learning startups and VCs in the UK. She completed UCL's MSc in machine learning last year after spending about a decade investing in high-tech startups. Sebastian Spiegler is a technologist at heart, an active member of the tech community, start-up advisor, VC and data scientist. He holds a PhD in Machine Learning & NLP from University of Bristol. Laure Andrieux is a London-based entrepreneur, passionate about how Artificial Intelligence (AI) improves our lives. She has a special interest for machines and humans interactions.